A revealing and surprising look at the ways that aggressive consumer advertising and tracking, already pervasive online, are being used by retailers near you. By one expert’s prediction, within 20 years half of Americans will have body implants that tell retailers how they feel about specific products as they browse their local stores. The notion may be outlandish, but it reflects executives’ drive to understand shoppers in the aisles with the same obsessive detail that they track us online. In fact, a hidden surveillance revolution is already taking place inside brick-and-mortar stores, where Americans still do most of their buying. 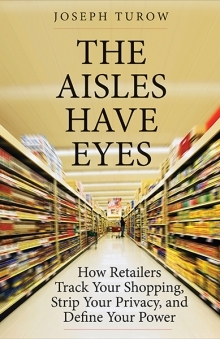 Drawing on his interviews with retail executives, analysis of trade publications, and experiences at insider industry meetings, advertising and digital studies expert Joseph Turow pulls back the curtain on these trends, showing how a new hyper-competitive generation of merchants—including Macy’s, Target, and Walmart—is already using data mining, in-store tracking, and predictive analytics to change the way we buy, undermine our privacy, and define our reputations. Turow is Robert Lewis Shayon Professor of Communication and associate dean for graduate studies at the Annenberg School for Communication at the University of Pennsylvania. He is the author of several books, including Media Today: Mass Communication in a Converging World and The Daily You: How the New Advertising Industry Is Defining Your Identity and Your Worth.